I have been getting back into my Tarot study during the college break, and have been looking at the numbered cards in the Minor Arcana and the corresponding card in the Major Arcana. As a framework for this study time I decided to look at one number every few days and see how the cards in different decks relate to each other. As it is nearing Saint Valentines Day, I am beginning with the number six – The Lovers. Except this card is not really about lovers as such, but of being in love, and not necessarily romantic love. It could be a new passion or obsession, a new country, a new career choice. Any sudden need to take a new path in life, something that overcomes you with all the power of Cupid’s arrow. Whatever you fall for can often result in a difficult choice, or even a rash move that may have huge consequences. But if you don’t make the move, and follow this new found love, then you will never know, which could cause a lifetime of regret. In this series of studies I intend to look at many different decks, but I will always include a standard Rider Waite Smith deck for comparison. For the sixes I have chosen my Pamela Colman Smith Commemorative deck, Tarot of the Wyrd, the Thoth, and The Wild Unknown. I am beginning by looking at The Lovers cards as they are the archetypal sixes and their symbolism shines light onto the minor sixes. The Lovers card relates to the sun sign of Gemini, which is evident in the symbolism on all of these cards, and Gemini is often represented by twins. Tarot of the Wyrd I think confuses the card a little, as in my understanding this card does not always represent romantic love, although they could be brother and sister or even old friends, but the love letter in the background suggests otherwise. The angel is there in the form of a wee cupid-like cherub, and although Gemini is an air sign this card has both the passions of fire and the emotions of water, which seem to go with romantic love. The RWS Lovers card is very biblical in its imagery. The angel is said to be Raphael and by the way he holds his hands he appears to be blessing the couple below. The mountain in the background looks to me like a volcano, which gives the card some tension. The serpent and the tree of knowledge are shown behind Eve, and Adam stands before the Tree of Life. But what will happen if they come together? I see this card as more of a balance of the energy of male and female rather than opposites. They are equal, they have not yet been tempted and the love they have is pure and innocent, and platonic. The Wild Unknown is a lovely interpretation of this card, with the two Canada geese flying free and yet together through the air, the sun shines on them blessing their journey. Unlike many birds, the male and the female Canadian geese both look very alike, and it is hard to tell whether this is two male or two females or one of each. I think the fact that we cannot tell in this card, is a wonderful piece if possibly unintended symbolism. To me is says that in love and true friendship gender is irrelevant. That’s my take and I am sticking with it. Then we have the Thoth Lovers card. This card is very focused on opposites, and in the background we have a large central figure who is hidden behind a veil. Like Raphael in the RWS, the hands appear to be held out as if blessing all the creatures below. There is cupid at the top and the serpent at the bottom. It speaks to me of choice and balance, everything being kept in harmony, but it cannot stay this way forever. A choice has to be made, and possibly with that choice comes sacrifice. The images in the Rider Waite Smith are familiar to many. The Six of Swords is about crossing from a place or situation or even a problem, to another place of solace and clarity. There is a hint of sadness. The way ahead is made clear, and the journey is easy once you know where you are going. Like many six cards it is about balance, responsibility and family. The ferryman works while the family rest, they in turn will pay him when they reach their destination. They have earned this fare, the books are balanced. It is a gentle card for a Sword. The family are in the capable hands of the ferryman, and the water is calm, there is no need for high passions or emotions. This is one of the most peaceful Sword cards in the deck. Maybe it signifies a world cruise even. The Six of Wands shows a procession of victory, or the arrival of someone important. It could be a new passion in the life of the querent, if so it may be fiery and short lived. I get the feeling this guy is resting on his laurels from the crown on his head, maybe a false triumph. At least it is a welcome break after the struggle in the Five of Wands. Still there are many around him waiting to takeover, well that’s how it feels to me. The Six of Cups is about harmony, good memories and family, especially children. The symbolism here reminds me of holy communion, and the card is about communion of friends and family and shared joy. It is a rainy afternoon over an old photo album maybe with grandparents or old friends. It is a happy and comfortable card in most RWS based decks. It is the most emotional of the sixes, but the six of cups is not about romantic love. It could represent a new or old friend coming on the scene but only in a platonic, brotherly way. The figure in the background is leaving the party, going back to the home, maybe this could represent the querent is some readings, looking for the comfort of the past. It’s a safe place to be for the moment. The Six of Pentacles is clearly about giving and receiving, the rich man gives to the poor. The Robin Hood card. The scales indicate balance. Pentacles relate to material riches, and this is what is being shared in this card. It could symbolise a small win or monetary gain, or it could equally be about donating to charity. Tarot of the Wyrd, (above), has very similar images to the RWS. The main difference is the Six of Watches, which shows a nurse, so rather than giving the gift of material things she is giving the gift of time, and as the key word says selflessness. Still they say time is money, and she is presumably paid for her work, so it has the same give and take meaning. I hesitated about including the Thoth deck in these studies, because I have not studied the system or any of the related teachings, except some astrology, in any depth at all. so Still a little learning begets more learning and so what the hell, I am including it, if only to compare the basics to the other decks I am looking at. I do know the sixes relate to the centre sphere on the Tree of Life. This sphere or Sephiroth is numbered six, and is called Tiphareth, which means beauty and harmony, balance. The cross symbol in the centre of the Six of Swords is one of the symbols used for Tiphareth. Although these cards are a lot more esoteric in their symbolism, they keywords are very similar to the RWS meanings. The Six of Swords is Science, which at it’s most basic level means to know. The card has a lot of clarity, the swords are sharp. The windmill like things in the background seem to symbolise wind or air to me, and Air is the element of Tiphareth. That could be wrong though, it is just an impression I get! The astrological symbols show Mercury in Aquarius… this could have a connection the the keyword science, as Mercury in Aquarius is very open to learning and stretching the mind. They see the bigger picture with ease. The Six of Wands is given the keyword Victory, the staffs are very reminiscent of the RWS image. The flames remind me of keeping the fires burning, Bighid’s flame, the torch they use for the Olympics. Astrologically it shows Jupiter in Leo. This pairing can represent someone who loves the limelight of success and victory, and it can be theirs through a benevolent and caring attitude. However, there is a need to take care not to let ego get in the way. The Six of Cups is Pleasure – again very similar to the RWS. It feels abundant this Six of Cups. Astrologically we have the Sun in Scorpio. Scorpios can easily become addicted to pleasure at the expense of all else, but this is all I can remember that seems relevant to the card right now. The image has a kind of family, passing down feeling with the central cups connecting to and filling the other cups. The Six of Disks is a lovely card, it has the sun, (from the Tree of Life sixth Sephiroth), a watery moon element, with the Moon in Taurus (Shown by the astrological symbols on the card), and Pentacles have the Earth element. Everything needed for things to grow and succeed. It is a very balanced card all round which again fits with the RWS symbolism. This card makes me think of putting something out to the universe and being in the right state to receive what you ask for. The Wild Unknown has fast become one of my favourite Tarot decks of all time. I will do a post about this deck as it does deserve at least one all to it’s beautiful self, but for now I am just looking at the Sixes, in relation to those on the other decks I have covered here. Six of Swords, no boat, but the swords are laid down, at rest. Maybe the battle has finished, at least for now. On the horizon is a colourful rainbow, a symbol of hope, just as in the RWS image there is a journey to be made, but a hopeful one. All is looking good for now. The Six of Wands is a kind of victory card. The butterfly has emerged safely from the chrysalis, escaped the ragged branches with it’s wings perfect where they could have been easily torn. It is above the troubled times below… just like the rider in the RWS Six of Wands. Still, this is a success for now, no one knows what lies in wait. Every battle won no matter how small is encouraging. The Six of Cups is a stunning card. I see the Tree as representing family and roots. The tree of now is so easily turned into the colourful branches of the tree of the past. There are many routes to follow and get tangled in for some dream time. Often we see memories as far more colourful than they were at the time, this card demonstrates this perfectly. The Six of Pentacles in The Wild Unknown like the Thoth card speaks to me of wishes coming true, the tree has borne fruit. When I look at this card the fruit is weighted to the left of the card which is bending the branch, this to me indicates that to attain balance some of the fruit could be given away, which will keep the tree upright and unbroken for more fruit to grow. In summary, six seems to have a fair but of duality about it in all of these cards, both the trumps and the pip cards. Choice, balance, harmony. Leaving and moving forward to new things, Victory yet also the possibility of loss of that triumph, sharing, giving and receiving. Although most of the cards are illustrated with people, the love could quite easily be a passion or hobby whose undertaking can represent a difficult choice to the querent. Sometimes the love for ourselves and our own fulfillment comes at a cost to those closest to us. As always the cards surrounding the six can cast light or shadow on the situation. I am enjoying this journey, the sixes were great to start with, I may pull a card to see which one I do next! I have been interested in learning about the Lenormand oracle and reading system for a couple of years now, but have not ventured further than admiring the many decks available, and lusting after a couple. As I have had a few weeks of more or less study freedom I thought I may try to get started. I decided the best way, (not to mention the most economical and potentially rewarding), would be to get an ordinary playing card deck and make my own. I took a playing card deck, a packet of OHP permanent markers, a fine permanent black Sharpie and a roll of white correction tape. I got my details and keywords for the cards from the Learn Lenormand website. I numbered each card and wrote the name on the top of the relevant cards from the playing card deck. So for the Rider, card number 1 in the Lenormand deck I used the Nine of Hearts. I screwed up on this card so had to bastardise another heart card to replace it! The words were written randomly with the fine Sharpie. I found that using the correction tape worked great for mistakes, and also for making white space to write the meanings on the court cards. You could also use white gouache. I found a lot of meanings for some of the cards, and now believe it would have been better to have one main keyword in large letters and a few in smaller writing. Anyway this is just the beginning, it can always be improved upon and developed. Katt, a fellow member of Aeclectic Tarot told me they use three decks so there are three of each card with an alternate keyword on each. In this way, when you lay out the cards you get a scaffold, if you like, of a sentence and you just have to fill in the blanks. Anyway, I am sure I will have fun playing, and making this deck gave me a lot of insight into the cards, in the same way that making your own Tarot Deck does. Lenormand is that bit easier to tackle as it only has half the number of cards! Another advantage of making your own deck is that ot gives you a basis to review other decks on the market before buying. Like everything in life it is ogod to have a go yourself in order to appreciate what goes into something. I am happy :) I shall make it a bag now… a cute wee one! I have owned Celestae’s Tarot of the Wyrd for a couple of years, but have not been able to spend the time with it that it deserves. I am surprised there is not more about it on the web, as it is a very special deck indeed. Tarot of the Wyrd is a deck by an artist known as Celestae. It is available from The Game Crafter. The gorgeous bag and cloth in the above photo, came from Toadwerks, one of my favourite Etsy shops. The deck is RWS based, and the images are heavily influenced by the artist’s love of Victoriana and dark Gothic imagery. I invite you to take a walk into the world of teacups and Gothic Victoriana, a world of magic inspired by an era of eccentricity and regal splendor. Each card tells a story, and every image has its own personality within that story. Included in the box are the 78 cards of the Tarot deck and a small folded leaflet in black and white giving basic meanings for the cards. There is no title or artist signed card with this deck. The Major Arcana cards have Strength at number eight and Justice at eleven as in the RWS tradition. Justice shows a very stern looking guy in a top hat. The Fool shows a child with a pet dog, a very Victorian image and the card is called Initiation. The Magician is renamed The High Priest and The Empress and Emperor are The Mother and Father. The other card that has been renamed is Number nine. The Hermit becomes The Shaman. The Death card is a lady in black, very like the lady in the movie of that name. A very dark and shadowy card, the image of the woman is very ghostlike. The minor suits have been changed slightly to match the period. While Wands are still called Wands the imagery is mainly umbrellas, parasols and walking sticks. Beautiful, Victorian china teacups represent cups. Pentacles are symbolised by and renamed Watches. Swords in this deck are Cutlery. All of the images fit the period beautifully, and the artist has worked hard, to make sure, they remain true to the Rider Waite cards. While I don’t usually like keywords on my cards, in this deck I am quite happy with them. They are subtle within the design of the cards. The typeface is distressed in fitting with the appearance of the cards in general. it was only on my second look that I even noticed the keywords. All of the cards have a dark raggedy distressed looking border which works really well with the old photographic images especially. The only think that irks me a little is that the black borders tend to have the odd white marks where the black appears to have chipped. It is a very small thing and it actually fits the whole look of the deck I guess. Anyway it would not be difficult to colour the edges of the deck with a black Sharpie, which would eliminate this issue. . I have even considered colouring mine gold or silver. The backs are a dusky pink purple colour with an ornate swirl pattern. They have a vintage photo of a ghostlike face at each end, and are fully reversible. The cardstock is a decent thickness, not too shiny and shuffles well. The cards feel like older style Tarot cards, not at all plastic feeling. The printing on my deck is not totally centered, as is the case with several other Gamecrafter decks, but again in this deck you hardly notice. Tarot of the Wyrd is one of my favourite RWS style decks, it is quirky, eccentric, and dark. I can think of no other deck like it, but if I had to try, I would probably say a cross between the Bohemian Gothic, The Zombie Tarot and The Housewives. Any lover of Victoriana or Gothic imagery is bound to enjoy this deck. If this deck were a movie it would probably be Arsenic and Old Lace, or a very dark version of Mary Poppins! Watch out for the new deck interview coming to you soon via this blog! Today I drew Luna from the Connessione and yet another Wand! The Five of Wands from the Tarot Noir. The Moon card is pretty serendipitous because I drew it today on the full moon. So a double whammy I guess. The moon card has some mysterious stuff going on. At first glance the two hands at the bottom seem to be squeezing dental floss from a tube and flossing the moon’s teeth. Then we see that the hands are half hands and half birds. It’s like the practical earthly side and the higher consciousness working together through the moon somehow. One hand feeds the mouth of the bird on the other hand. The hand that is not holding the tube holds some pebbles that may have come from the water, the fingers look a little bloodstained or maybe it is just sand. I am very much a Moon person, by birth and nature. I love the hours between 8.00pm and 8.00am, my lowest time is early afternoon. The lower the sun sinks in the sky, the happier I become. This card feels very right now. The Five of Wands is what I call the play fight card, five has a feeling of 2 pairs and an odd one out. Sometimes I feel like the odd one, but in a food way. I am part of my family yet single, the mother creature. This card can mean stress and disagreement, but I think today it is telling me to enjoy the playing, be more frivolous without guilt, because I have earned this time to play. Especially as it is the holidays here in NZ! The Moon throws a happy shadow on the five of wands too, and the cards of the past two days having been wands adds to the positive nature of this five. Taking the two cards together I see the Moon card as dreamy, playful, even a little goofy. I can never sleep around the full moon, I get maybe an hour or so and then wake up, usually around 3.00am. Sometimes this is ok. I have learned over the years not to fight sleeplessness, but to use those wakeful hours more positively. If it means I am fit for nothing during daylight hours then that’s just fine…after all there are 2 weeks of holiday still left. I haven’t had time to study the cards in depth recently, but I am hoping to get back into the habit over the holidays, and beyond. Tarot study gives me quiet time, a space in which to meditate and contemplate. We spend so much time rushing from one thing to the next without stillness, as if we will miss something if we stop for breath. For me the opposite is true, I know I miss so much more of life by treating it like a moving walkway in an airport. It is important to me, to take time to do the things that bring me joy and add depth to my hours. The Tarot has been part of my life for so long, even with a new deck the relationship is somewhat established already. Sitting down with the Tarot is like taking tea with a close friend, comfortable and honest. This week I am using two decks, The Tarot Noir by Chronata, and the Tarocchi di Connessione. The latter is a major arcana only deck, in English it is The Tarot of Connections. The Tarot Noir is a Marseilles based deck, with funky black and white images, no borders and rounded corners – perfect. I drew a card from each, Limits – XV from the Connessione and the Ten of Wands from the Tarot Noir. The Connessione artist different names for the cards, and Limits is usually The Devil card. The image shows an angry character firmly grasped in a hand, which he doesn’t seem too happy about. It feels as if he has been exposed for who he really is. The quilted cocoon that he is wrapped in suggests luxury t0 me, a luxurious prison. There is writing scribbled on the wall but even with a magnifying glass it doesn’t read as anything much just a few letters. Below the devil critter, on the bottom half of the card there are many cages. So we have someone in a prison of their own making, and the writing is on the wall. But I wonder if the hand is that of the devil, who has the person in his grip — or, is the devil the one being held? Could be either way. The Ten of Wands here is a tightly locked knot too. It feels too bound, too stressed, a barrier to going any further without change or some let up. This card combined with the devil seems to underline a feeling of being held captive. It also makes me think of an illusion of order and strength that in reality is a cover up for something very out of control. I think maybe I have overdone the partying this holiday season, and need to cut back now, before it becomes my master. I need to be in control, as I do have an addictive personality. Well, the cards are definitely honest and brutal at times. I love it when you pre-order something months before it is made, and then almost forget about it, so that when it arrives it is just like a present from the Man in the Moon, or some other benevolent being. Today, my Bohemian Gothic Tarot – Third Edition, arrived from Baba Studio in Prague. Actually make that: They. Are. Gorgeous, as I also got a mini version of the deck. As with the first two editions, the images have been altered slightly, some more than others and the backs are completely new. There s an extra new Lovers card in both the large and small deck, which is nice to have. I hope one day Baba do a deck with a Happy Squirrel card. The mini deck has the most stunning gilded backs and the cards just slide through your hand like water, but as they are small they are easy to keep hold of. I love them. I can’t stop shuffling, letting them slide from one hand to the next, it’s kind of like playing with a Slinky toy. The cardstock used in these decks is my favourite so far, although I do love all my Baba card stock. Since I first sang the Christmas carol: In the Bleak Midwinter, I fell in love with the words of Christina Rossetti. Later, while studying art at grammar school, I fell in love with the paintings of her brother, Dante Gabriel Rossetti. I recently discovered a wonderful Rossetti Archive online, which is dedicated to his work. While browsing through the a book of Rossetti’s poems, I came across a poem by Dante entitled The Card Dealer. Dante’s poem was inspired by the painting shown below, a work by a 19th century British artist, Theodore Van Holst. The painting is entitled The Wish, but has also become known as The Card Dealer after the title of Dante’s poem. Long time no post, I have been so busy with college, family, making bags etc, I have had little time to blog here. I intend to change that over the next few days as life settles down a little! Meanwhile I wanted to share this new project by Nakisha Vanderhoeven who created the wonderful TaRat, The Rabbit Tarot and the Blue Dog Rose tarot. The new deck looks gorgoeus, particularly for those of you who love nature. I think it will work well with my Wildwood and also my NZ Naturally Tarot. The Druid Animal oracle would also play well with this deck! Plans for it already. 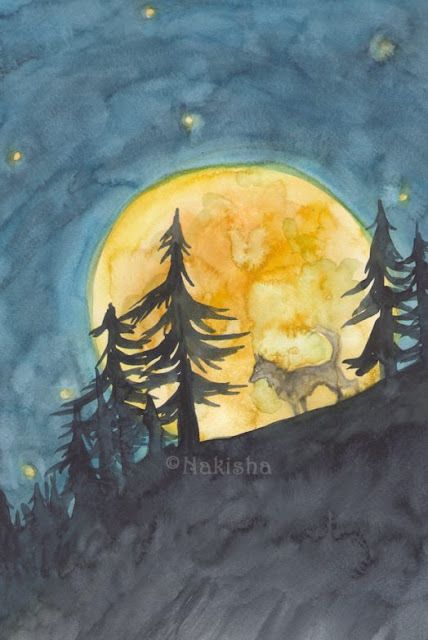 This new deck is going to be larger than Nakisha’s previous decks and although I love their small size it will be nice to see her beautiful artwork in more detail! Go and check out Nakisha’s videos and her Kickstarter project! This is WONDERFUL…. for the lover of words, poetry or Tarot… or as in my case… all three! I love listening to Enrique Enriquez, his words are precious…!